The Funky Felter: Yay! My handmade shibori style nuno felted scarf was featured! Yay! My handmade shibori style nuno felted scarf was featured! 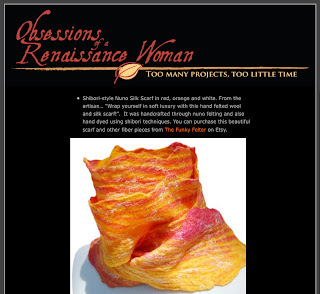 I just wanted to mention that my shibori style nuno felted scarf was featured in Kelly Callahan's blog. It is one of her picks for the "Handmade Gifts for Her" guide. She really made some spectacular choices of handmade items, and I am honored that she included my scarf in the mix. Thanks Kelly!